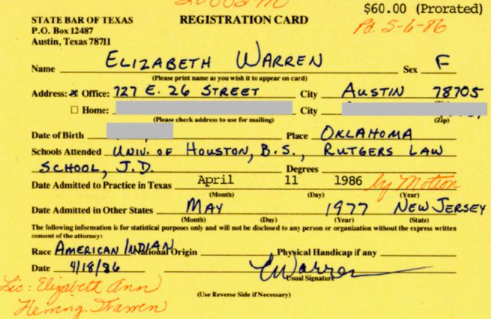 Elizabeth Warren’s State Bar of Texas Registration Card in which she claimed she was an “American Indian” in 1986. Washington, Cambridge, and Austin, February 6 – United States Senator Elizabeth Warren, who is running as a democrat for President of the United States, lied on her State Bar of Texas Registration Card in September, 1986. Unlike today when attorneys may submit their profiles online, in the 1986 time frame, attorneys licensed in Texas submitted their profile information by card. Under the State Bar Act, it is a violation of the Disciplinary Rules to provide false information to the Bar. In 2018, Warren obtained DNA test results, after claiming for many years that she was “Native American” or an “American Indian.” As a Law Professor at Harvard University, Warren and the University both bragged that she was a “native American” on the faculty. Warren’s DNA results revealed that she is 1/1024th Native American, which is substantially less than 0.001%. The ultra-liberal democrat from Massachusetts has desperately sought to claim some sort of special status and even has claimed she’s kin to members of the Cherokee Nation. Secretary Hoskin makes a good point. Fake claims of minority status don’t bond the claimant to the group. Rather, they are and should be offensive to the group. Rachel Dolezal’s treachery towards African-Americans in her position as President of the Spokane Chapter of the NAACP mocked and stereotyped African-Americans. Her behavior was an insult. President Donald Trump defended Native Americans with his mocking description of Warren as “Pocahontas” to bring forward the point that her remarks were inappropriate.